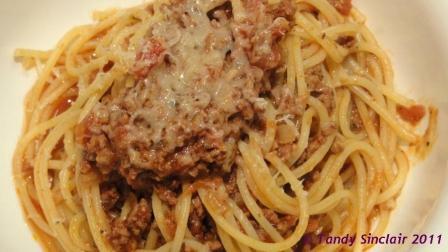 I have read a few recipes for this classic ragu in the past couple of weeks, and here is mine for Spaghetti Bolognese. I once read that there is in fact no traditional ragu from Bologna. We commonly refer to this sauce as bolognaise which is the French term. When we were on honeymoon in 2003 we went to Bologna twice. The first time we arrived in the morning and went straight to the Ducati factory. This in itself was an adventure which you can read about here. The second time we went was to go to Ferrari (notice a theme?) We arrived in the morning from Rome and checked into our hotel. We then walked back to the train station and started the very long journey to Maranello. We caught a train to Modena and then from the train station, we caught a bus to the bus station. And from the bus station we caught a bus to Maranello. And when we got out of the bus, and started walking to Ferrari, we saw a sign “Bologna 43km”. Our trip had taken 2 hours. We walked around the Ferrari museum, and it is amazing and we spent some money in the shop. After this wonderful walk through history we went to the bus station to reverse our trip. However, we had a wait for the bus and so we walked around the cemetery and then we went to Nello’s pub and looked closely at the walls at all the famous Formula 1 winners’ signatures, including Jody Scheckter’s. After our visit to the pub we caught a bus and another bus and then went to the ticket machine at the train station but there was no train to Bologna! Thankfully we knew that the train to Rome would stop there and so we got our tickets (and watched some Italians follow us with gratitude) and went back to the hotel. That night when we went for supper I had a ragu, a traditional Bolognese, nothing at all like the ones I had previously made! This recipe is not traditional in the slightest, but is made with the memory of Bologna close to mind. This soudns like a very nice recipe,Tandy!! I like the addition of olive tapenade! I will have to make this! I have been to Bologna a couple of times: I really like the city. I have to admit that I have not been to either Ferrari or Ducati. I am glad you have good memories of your visit. Making this pasta dish is a way of bringing back the feeling of being in Bologna. Thank you so much for our contribution to Presto Pasta Night! It´s true – none of my Italian family really ever eat this. Perhaps with larger chunks of meat braised in the sauce as a ragú, then taken out and eaten after the pasta with tomato sauce. Having said that, I adore it and love the addition of the olive tapenade. What a great idea! Not something Pete enjoys so I never make it – think it might be another boarding school thing. Yours looks superb though – I might have to come and enjoy a plate of it at your place sometime. the bed is waiting for you!